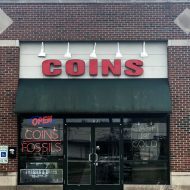 Jim’s Fine Coins, Fossils & Minerals, just opened its arms to a new, easy to get to location, 2 miles east of I-355 on Ogden Ave. in Downers Grove in Dupage County in the Chicagoland area. Here at Jim’s Fine Coins, Fossils & Minerals, customer satisfaction is the most important rule. Once entering our facility you will always be greeted by an associate ready to help you find, and explore what you’re looking for. Stop in often as we get new stock on a regular basis.